Every month, thanks to the underwriting of my Patreon supporters on the Half Hour Hegel project, I hold one online Q&A and discussion session, completely open to the general public (we also host another just for Patreon supporters as well). 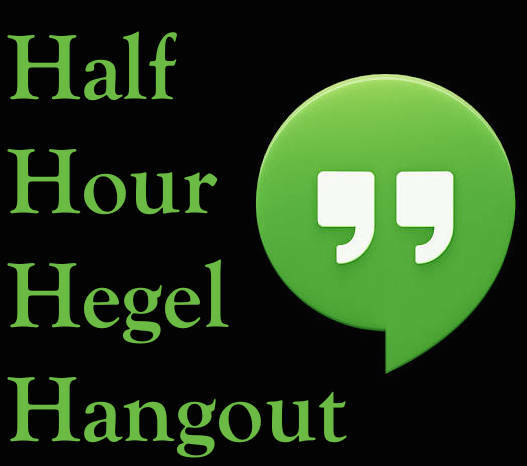 So if you've been reading Hegel, or following along with the videos, or even just want to know what all this Hegel talk is about, feel free to join us. We use this FreeConferenceCall link - clicking it takes you right to the ReasonIO "meeting wall", and then it's just another click (and perhaps downloading the app), and you're in! We're meeting today, Wednesday, May 9, from 5-6 PM Central Time - so make sure to check the time difference if you're in another time zone. Don't feel like you have to know anything about Hegel in order to participate. We do a good bit of Q&A in these sessions - and I give priority in the discussion to any Hegel-related questions participants ask! Hopefully I'll see some of you readers of this blog, and followers of the Half Hour Hegel project there!